Skin of the scalp is thick and dense; it is intimately connected to the subcutaneous tissue. It contains hairs and large number of sebaceous glands. Arrangement and distribution of hairs on the scalp is a secondary sexual character. This is considered as the modified superficial fascia. It is called tela subcutanea. It is divided into innumerable compartments called locules by fibrous septae. Within these locules fat is found. It is non elastic, so it does not permit enlargement. Hence collection of fluids or infection within this layer is highly painful. This layer is called the neurovascular zone of the scalp as it contains nerves and vessels. The vessels are firmly attached to the fascia. This fascia connects the vessels with skin and aponeurosis. Hence during wounds of the scalp vessels are wide opened. This causes severe bleeding. Vessels and nerves are arranged in a radial fashion so incisions on the scalp should not be circular. 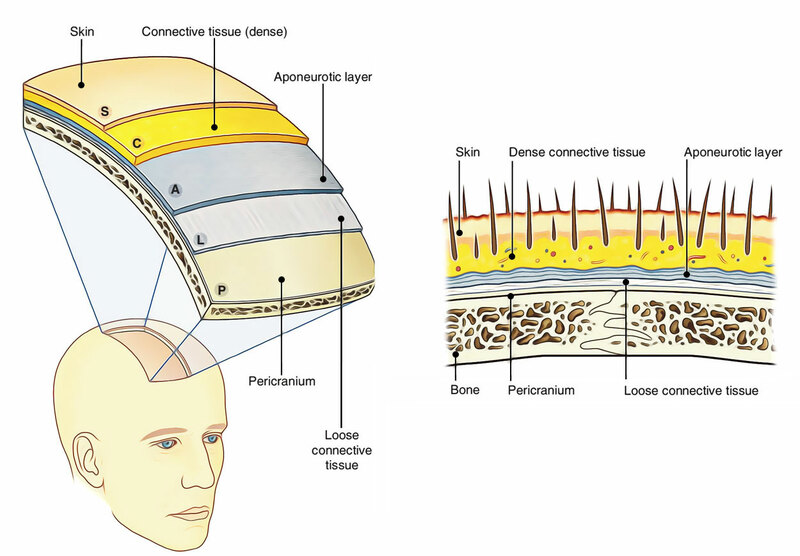 As this layer has dense connective tissue, during injuries of scalp deep compression will stop bleeding. Due to good blood supply, necrosis does not occur in this layer. The aponeurosis is called galea aponeurotica. It connects the frontalis and occipitalis muscles.